Hope the picture turns out alright. 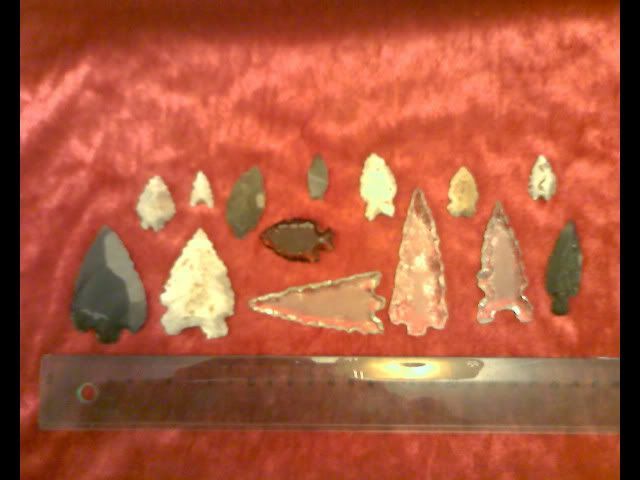 These are my attempts at knapping glass and flint. Give me another 10 years or so and I might get the hang of it. Well, it's got me scunnered! I can't get the pictures to load. I'm obviously doing something wrong but not sure what. Whoohoooo!! Done it! Just don't ask me how. Impressive, I like white flint, I'm really jealous, that looks to be pretty good stuff. They're also way better than my first attempts. Thanks, they're full of the usual beginner's faults, but it is good when the odd one ends up looking like it's meant to look. As for the white flint, I was at a couple of metal detecting rallys in Yorkshire. Didn't find much, but came back with pockets full if flint. i totally agree with grendel, thats really nice work, and you clearly get it already! i think it's also worth remembering that if you were making these things for hunting/survival, they just gotta be sharp and pointy - the "art" side will come with practice. at least that what i keep telling my self! Thank folks, appreciate the comments. I do agree with the sharp and pointy view, if it looks nice, that's just a bonus! Look forward to seeing everyone elses work, we can all learn from each othere here. As to getting good flint, I'm seriously considering a little holiday/flint collecting next year. I'm thinking of heading to some of the well known flint areas in England, and possibly taking in some of the Hadrians Wall forts and museums on the way back. Visiting a chalk quarry is an excellent way to get flint. You can fill the boot of your car up for under a tenner. Sadly, we produce chalk, we produce limestone (ancient quarries dotted all over where I live), but only one known flint quarry. And that's in Aberdeen. (and the archies wont allow us to have a rake about:( ). There are a few harbour areas where flint is abundant (ex ship ballast), but haven't tried it out yet. So will have to inport it. Good excuse for a holiday though.